If you are planning to visit Loch Lomond which is in the Trossachs National park Scotland, you will not be disappointed by the splendid scenery. Find on this page information about Loch Lomond. Everybody is familiar with this famous Scottish song, and never truer words have been sung. It is indeed one of the most famous and beautiful parts of Scotland. Perhaps you are planning to visit Loch Lomond, and The Trossachs National Park,and would like some more information. 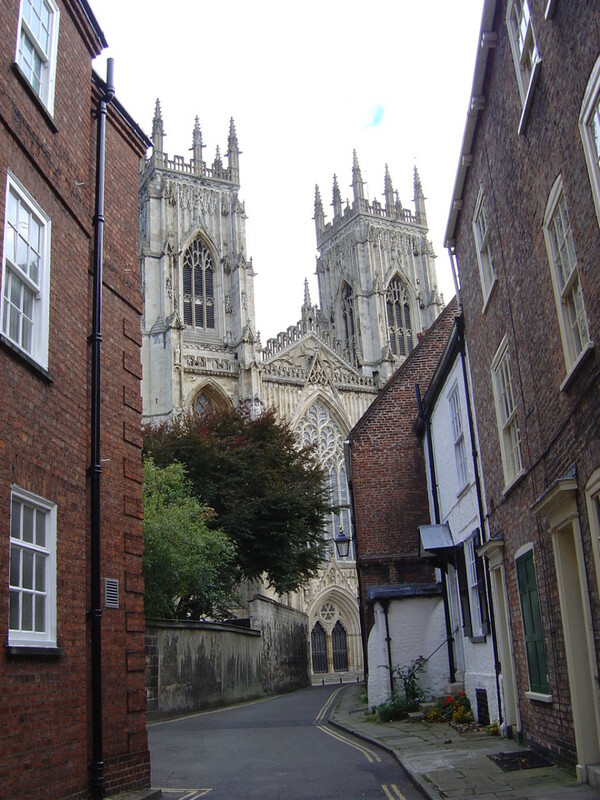 Why not join the 80,00 people who visit this area every year. Join me as I take you on a personal tour of the area, from North to South, East and West, following in the footsteps of many before us, on the historic footpaths, with ruins that remind us of lifelong ago, adding to the mystery and romance of the Loch. I will take you on a more personal tour of natural beauty spots often missed by visitors to the Loch. 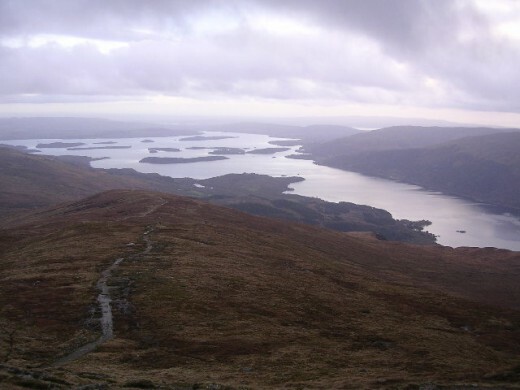 Loch Lomond is huge, and is indeed a natural wonder, though you would not just decide to walk around it one day. In fact I would suggest several days to explore and appreciate the full beaty offered by the Loch. It is 23 miles long, 41/2 miles wide, 630ft deep, in certain places deeper, and covers 18,000 acres. It is also 22ft above sea level. The landscape is rugged and full of hills and hidden glens - ( a narrow secluded valley in the mountains), this is what gives the Loch the magical romantic feel. There is much debate over exactly how many islands there actually are,as there are differences of opinions in exactly what makes an island, some are just barren rocks. Roughly 23 Islands give or take. Dotted along the shoreline of the Loch you will find many Caravan and Camping sites, however due to a Scottish law 'The right to Roam.' Many people do indeed think that is exactly what they should do, often leaving debris and rubbish after them. Unfortunately along your travels you will see many camp sites that have been used and just left, ruining not only our beautiful landscape but also leaving harmful and dangerous rubbish for our wildlife, some which are near extinction. I was brought up camping by the Loch side on a great bit of the Loch called Milarochy Bay, near Balmaha, a stretch of shingle beach,and I indeed learned how to swim at that very spot, it is now a magnet for the jet skies and motor boats. I would advise anyone coming to the Loch to please read through the Scottish outdoor code, we are given a lot of freedom around the countryside to explore all the 'nooks and crannies' it is only right we are respectful to the land. Listen to this wonderful song as you continue reading. Welcome (Failte is the Gaelic) to your personal tour of Bonnie Loch Lomond, which lies within Scotland's first National Park. 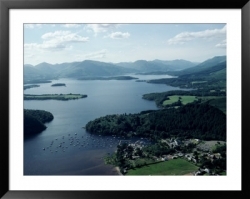 Loch Lomond is positioned in central Scotland, and is by area, the biggest Loch (lake) in Britain, although Loch Ness is biggest by water volume. There are several ways in which you can enjoy the spectacular views and history along the way, you can travel along the western side of the Loch by car on the A82 road, I remember this as a little girl and it was the scariest road to travel, imagine a road carved out of the hillside, with a drop on the other side right into the Loch itself, with lots of tourists confused at driving on the wrong side of the road. Thankfully the road has now been upgraded and it is indeed a beautiful way to see the Loch in all its glory. The north- east side is only accessible by road part of the way, to Rowerdennan, then by following the famous Scottish walk The West Highland Way. Please note : I refer to different parts of the Loch throughout this page, so I have tried to help you gain your bearings and color coded the map to match the area's I am talking about. The Loch is on the western side of Scotland, and stretches from Balloch (Near Glasgow) in the South to Ardlui in the north. Ardlui is the very northern point of Loch Lomond, and is a popular destination, lots of caravan and camping sites, although remains quiet and unspoiled, only the boats dotted around the marina, show how popular this side of the Loch is, for many who prefer the quieter life on the Loch, this is where you will find absolute peace and tranquility. Balloch which is roughly 14 miles from Glasgow sits snugly at the South side of the Loch, where the loch then feeds into the River Leven, Balloch is a popular destination for visitors to come to and where you can take a boat from the pier, sit back and relax and enjoy the Loch from the vantage point of being on it. 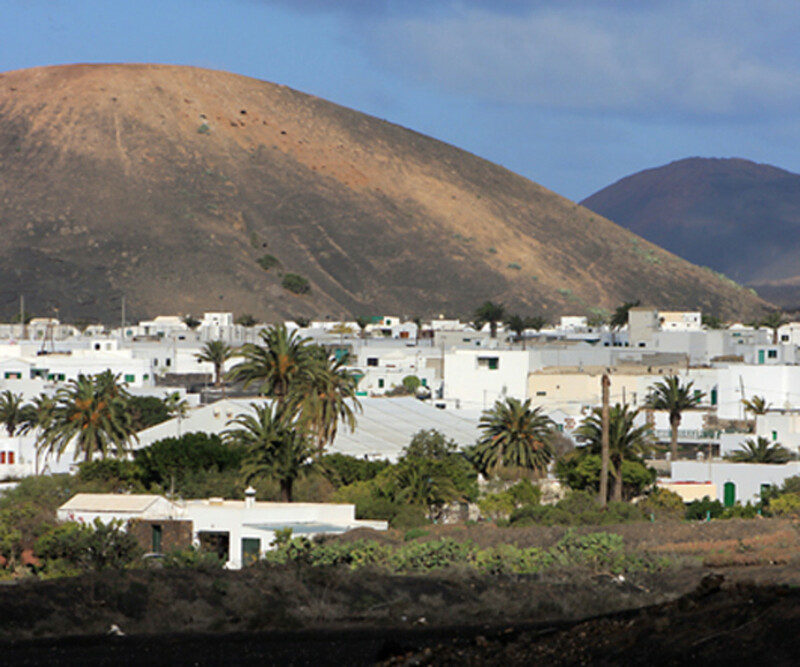 This is also a popular place for boat owners, and is a fantastic leisure activity. Lomond Shores was created as a gateway to the Loch,It is where you will find the Maid of the Loch, a Sea Life Aquarium and shops, it is open all year round and is a fantastic visitor attraction. At Balloch Pier you are able to board the last paddle steamer, she was the last built in Britain, The Maid of the Loch (picture to the left) and has been restored to her full glory. Although does not sail now, she truly is a magnificent sight on the Loch. The West Highland Way, a famous long distance walkway of Scotland, all of roughly 96 miles of it, part of it runs along the eastern bank of the loch. The Oak Tree Inn, beautiful, home cooked dinners, complete with log fire, the smell of burning peat, and a whisky selection you get lost in. Now if you were to look directly over the Loch at this point you will be pleasantly surprised to see the famous world championship Golf Course at Loch Lomond Golf Club which attracts household names and hosts world class golfing tournaments. If you have watched the Barclay's Golf Open on the TV then you will see the boats on the Loch, watching the game for free, with the Loch and the majestic Cameron House which has the most beautiful and dramatic setting. attracting the rich and famous for a private retreat on the Loch. You can visit all the Islands, many will take their boats to some of the islands for the day, there is always an Island that you may find yourself the only person there. Clairinch - The Flat Island. Inchcailleach - The Island Of The Woman. 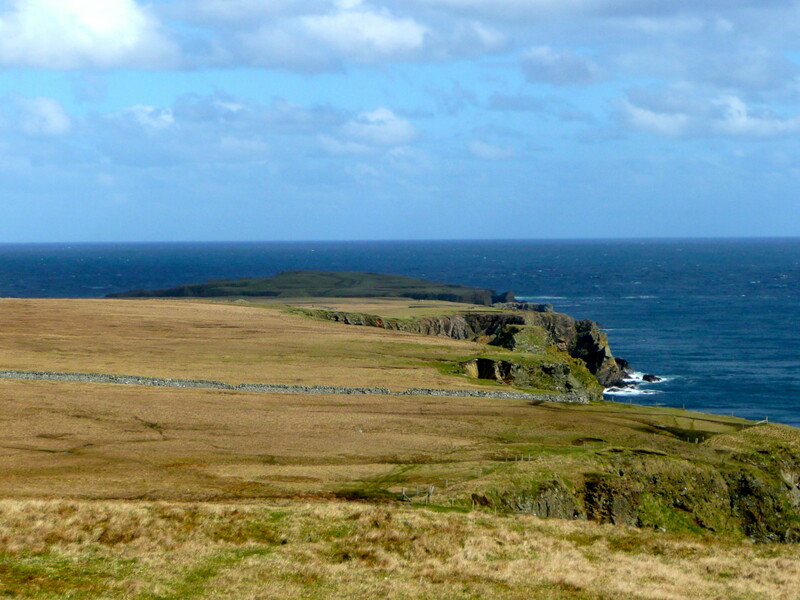 Inchmoan - The Island of Peat. Inchconnachan - The Colquhouns Island. Wallace Isle - The Island of Someone Called Wallace Was it the William Wallace or just someone called Wallace- we are unsure. Inchlonaig - The Island of Yew Trees. 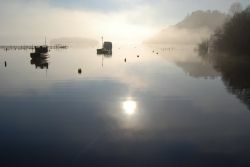 One of the most popular Islands and probably with the most history is just a stones throw away from Balmaha. Now if I were to tell you that a very dear friend who runs aB&B has this view, what would you think, are you jealous yet? You can see the beginning of the Island in the photo just off to the right. Bob and Debbie who run the family B&B, (also have bunk houses, for walkers) have the enviable position right at the waters edge looking onto the Loch and across to Inchcalleoch or 'The Island of the Woman'. There are still the remains of the Church, which was built in her memory, local parishioners would row over to the island for their Sunday Worship. I have indeed canoed to this island, and you should take to the water to experience its true glory. The feeling of being on the water in that kayak is something hard to describe, bobbing along, a feeling of freedom out in the middle of the Loch with nothing else around, surreal with the silence only being broken by the paddle slicing the water and by the odd bird passing overhead. The smell is so clean, and fresh. This is truly a magical expedition, when you arrive at Inchcalleoch jetty, you climb up the pathway to the top of the island, through the trees, passing ruins, where you could imagine people living out their daily lives, heading towards a sheltered picnic and barbacue area. As a Sunday School group this is where we visited every year, and it still holds the magic of that first visit. 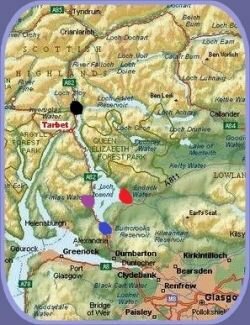 Bob and Debbie also run Lomond Adventures,where you can hire canoes, Albacore sailing dinghy or even a catamaran discovering the beauty of Scotland's most well known Loch. Heading home to watch the sunset just behind the island from your own private veranda - not bad for some. Bob is very knowledgeable about the local area and can take you on guided tours visiting islands of beauty, full of history and legend. You might see Osprey, Sea Eagles, Capercaillie, white deer and even wallabies on a secret island. Yes I said Wallabies, which you will find on Inchconnachan Island. 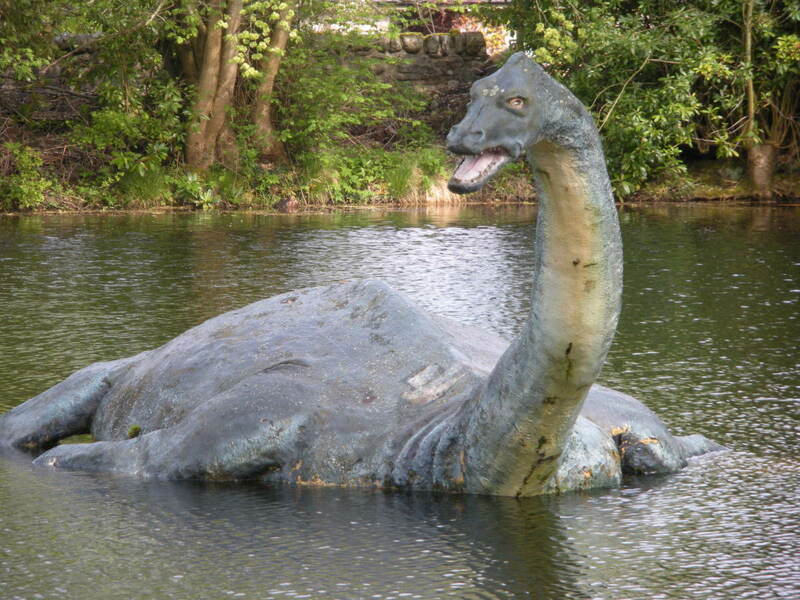 These were released into the wild the lady of the island and have continued to breed. Recently though there was to be a huge cull of the wallabies as they were threatening one of Scotland's own native wildlife species the Capercaillie, (As seen in the picture) a rare bird from Scotland on the brink of extinction. Because such protected native species need diverse vegetation to survive, the Scottish Natural Heritage announced they would work with the landowner and the forestry commission, to create a holistic management plan. We are indeed still waiting for that plan. In the sleepy village of Tarbet,Colemans Cottage set a midst beautiful gardens,in fact all two acres of unspoiled grounds, with stunning the views of the Loch, and across to Ben Lomond, its origins can be traced back to the Scottish Rebellion of 1745, and under a Yew tree still standing is said to be where Robert the Bruce once assembled his army. The Munros, are a beautiful collection of Scottish hills and mountains, that are over 3,000ft, and Ben Lomond (the Beacon) sits just at the eastern shore of Loch Lomond the most well known being Ben Nevis, as with most things we like to shorten these names affectionately calling them the 'Ben'. 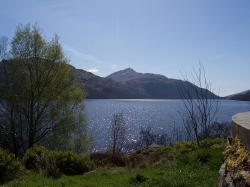 The 'Ben' is a beautiful walk and is quite easy, (only not on a hot day) and accessible from Balmaha, following the road to Rowerdennan which is just 11miles further up the Eastern Loch side, where you find the path taking you to the easy walkway to climb Ben Lomond. Be sure to wave to my mother-in-law as she has the enviable view of the Ben from her front window. 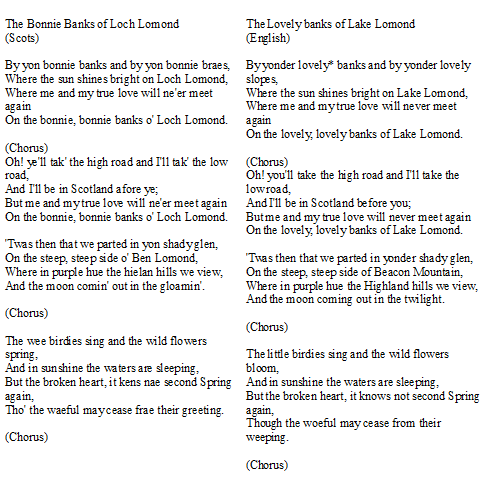 The Bonnie Banks of Loch Lomond - What does the song really say? and so we are near the end of our journey, so I thought what better way to finish than to find out what this song means? There are a few stories of what it means, one being the capture of a famous Highlander, Bonnie Prince Charlie, saying goodbye to his lover who he spent many a happy day on the Banks of Loch Lomond. Or it is believed by some that 2 soldiers were captured, taken South where one was killed, leaving one to take the physical "high road" walk home the spirit taking the "low road" (the after life) and how the dead soldier would never be able to meet his lover again, on the Banks of Loch Lomond. Are you a romantic or a believer in the afterlife? Hello Janet and AdrianIt all sounds faainsttc.On your travels through Scotland, if you are passing through Inverness, and happen to go anywhere near a village called Glenussie, could you think about taking a photo. My great grandfather, Alistair MacIntosh was from there, and I have always wondered what it looks like.Please don't make a special trip there; its only if you are passing through that way. On the subject of camping on the shores of Loch Lomond, the local authority has changed the bye-laws recentlhy and are much more strict on wild camping there. This has resulted in what I call 'yobo campers' moving north to either Glen Orchy or Glen Etive - and doing there exactly what they were doing on Lomondside. Some people are beyond help, I'm afraid. I know the trossachs well. I have wondered the bonnie banks many a time and climbed many of the hills there. 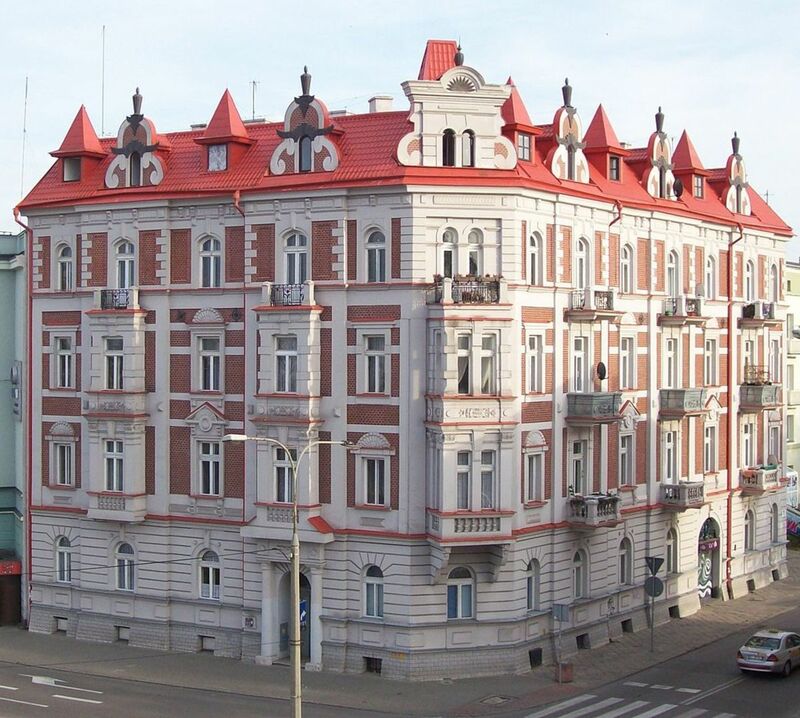 It is quite beautiful and very accessible. I have never been to Loch Lomond, but Scotland is where many of my ancestors came from and I would love to visit some day. It looks like a beautiful place. Gorgeous. I want to visit Scotland. I have never been to Scotland before, but have been to England and Ireland. It looks like a great place to live and visit. I always wondered where Loch Lommand was. Looks as pretty as the song. What a stunning place, you are an excellent guide! That looks really amazing! wow! My sister and I used to see the song of Loch Lomond when we were young. I am not sure where we picked up the words but they were a fun song to sing in a deep Scottish accent. (Being Scottish I guess we just naturally were drawn to that song). Lovely lens and thank you for a wealth of information that I did not know about Loch Lomond and the song which bears it's name. So many happy memories! We used to have a lodge at Cameron house and spent lots of great holidays there. Blessed! interesting scottish history page. thanks for this lovely read. I like the stories about the song, and the little tidbit about the steamer that no longger sails. I love the personal tour and the special touches you shared about Loch Lomand. Just beautiful. blessed! 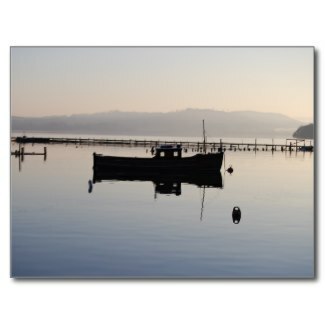 Hi Lisa, neat Lens, I actually lived up the road in Helensburgh during my Naval career and was at Loch Lomond many a time, very nice indeed, is it OK to Lensroll to my Scotland site? Looks like a beautiful place. I'd love to see Scotland some time. Lisa, wonderful lens on Loch Lomond. Now, you have me wanting to visit. Enjoy another Blessing for your efforts. Beautiful lens! I really enjoyed this. I'm eager to visit. Blessed by an angel. I enjoyed your wonderful lens on Loch Lomond. Hopefully some day I will get to visit this wonderful, magical place! Beautiful lens Lisa. I really enjoyed reading through. Your virtual tour around the Loch was very informative yet romantic. This is a really wonderful lens Lisa. I know Loch Lomond well as we used to holiday in Scotland when I was a child and this brings it all back - especially your description of the road. I'd forgotten all about that! I can't say I had a favorite part, but I did love having the music play in the background while I read your lens. It certainly does set the tone for this trip through Loch Lomond. Great job, Lisa! Your love for Scotland certainly shines through your writing! Wonderful lens Lisa. I would love to get that far north one day. Loved the link above to become a laird. I did something similar for Debbie's birthday several years ago, making her Lady Deborah of Sealand, which is the smallest municipality in the world. Actually it's an old fort 12 miles off the coast in the North Sea, but it was a fun thing to do. I've loved the song for years, but I never knew much about the Loch itself. It sounds a bit like the lakes in Northern Minnesota where I spent my summers as a kid ... including the biting insect forecast! Now you've got me wanting to take a canoe trip on Loch Lomond! 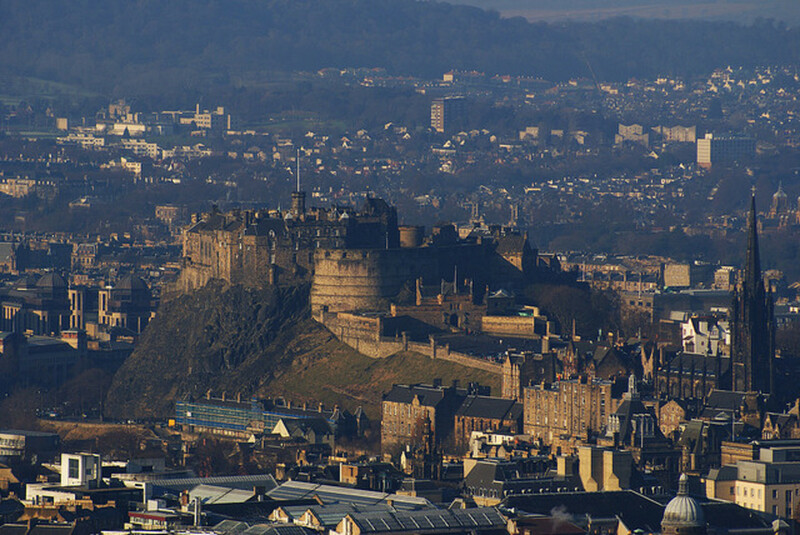 Scotland is at the top of my "wanna visit" list. Lovely lens! I started reading this lens then got pulled away by my kids. I've had Bonnie Bonnie bank of Loch Lomond going round in my head ever since. I've always wondered what it meant. Lovely lens. Beautifully presented lens. I think it is one of your best. Would love to visit some day! I loved it! Thank you for showing me around this lovely part of Scotland. Thanks for sharing this informative visit to Loch Lomond. I suspect that a Womans Shearling Aviator Jacket would keep one warm, fashionable and cosey whilst traveling to such a beautiful serene place. 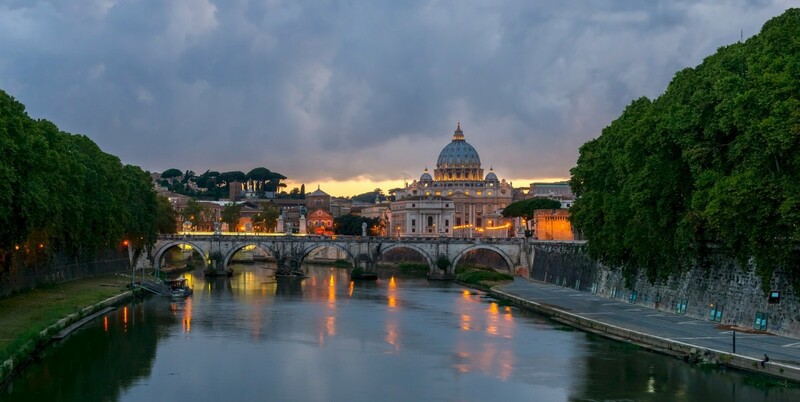 I love the vivid imagery (both in words and photos) of what must be a magical place. Well done indeed ! Wow... Beautiful lens! I really loved the pictures.. I am a visual type of person! Learn something new everyday! Lovely lens, love visiting Scotland and this is an excellent tribute to the area! Loved the song, the descriptions and tips and the photos! I have a trick I use to understand accents...I tell my ears to calibrate to whatever I'm hearing. About 20 seconds go by and all of a sudden I can understand what's being said! Loch Lomond is a beautiful place. I grew up singing the song but never knew anything about the place. Thank you for the introducation. Lisa, I loved it all! From the song to all your wonderful photos and so much great information, brought back many childhood memories for me. I remember the Capercaillie but not wallabies, and of course the midges! Great job! A perfect tribute to a very beautiful part of Scotland. 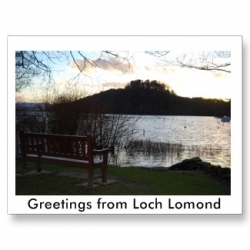 Thanks for reminding visitors to keep Loch Lomond as pristine and lovely as they find it. It truly is a place worth protecting. What a beautiful lens for a beautiful place! I definitely need to remember to visit the Loch Lomond on my next trip to Scotland. You pictures are quite lovely! Gorgeous lens, Lisa! I love all of the pictures. I'm so happy you were able to take part in the Jenga Tower. Whether I make the move over or just travel to Scotland the Loch Lomond will definitely be on my list of spots to visit! WOW. Lisa, I am very impressed! I love the amount of detail you put into this lens. I'm only sorry that I don't have blessing powers anymore!